January 2013 – Finding a new "normal"
Trouble never seems to show up alone. Like misery, trouble loves company. “When will it get better? !” one of my dear children asked me in exasperation today. I wish I could give a more encouraging answer, but my only honest answer is this: The one thing we can count on is change. If things are going very badly now, they will eventually get better. If things are going great, then buckle up because something difficult your way cometh. I’ve written a few times about how imperfect our joy is here on earth. I don’t plan to beat that dead horse again. I do think it’s important to point out that, many times, in the middle of trouble, something wonderful walks in with it. I could share a few examples of how that has looked in my life, but I’d rather not spoil your own process of remembering how it has looked in your life. You know, you lose something you really thought you wanted to keep only to discover that, had that disappointment not happened, you would have never found this other thing that suits you so much better! It could happen in the context of jobs, favorite activities, or relationships. The point is, when a whole lot of trouble walks into your life, keep your eyes peeled for the Wonderful. When trouble swirls around us, it’s easy to feel worried about how long it will stay around. Individual troubles can seem far worse when paired with other troubles and that perception tricks us into feeling hopeless. Trouble is like a virus – it can wreak havoc while it’s around, but it does have a lifespan. It will go away. Of course, there’s always another trouble waiting to take its place. Jesus is recorded in Matthew chapter six as saying, “Do not worry about tomorrow, for tomorrow will bring worries of its own. 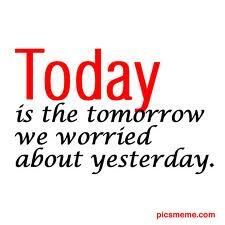 Today’s trouble is enough for today.” What is it about trouble that makes worry its constant companion? Why is our worry activated instead of our faith in times of trouble? Worry is far more concerned about tomorrow than faith is. Faith finds contentment in the grace today brings. Faith knows trouble will come, but knows more how to see the Wonderful in its midst.